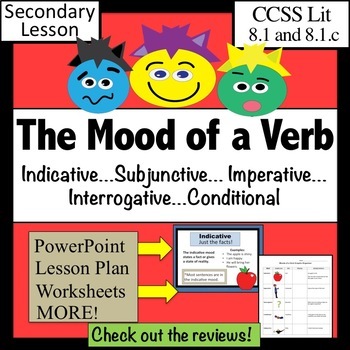 The Mood of a Verb- subjective, conditional, imperative, interrogative, and indicative - are presented in this Common Core lesson. 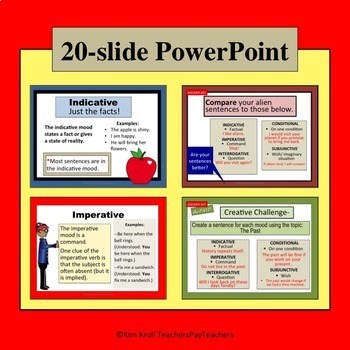 Task cards, PowerPoint and more help make this lesson easier to teach- and easier to learn. Check out my reviews. This is my Best Seller! I've tried to make this topic a little snazzy. Generally, students feel that verb moods are a bunch of big words that are not relevant. My goal is to connect a visual with each mood and have students understand each mood through various activities. The graphic organizer works really well with my 8th graders! 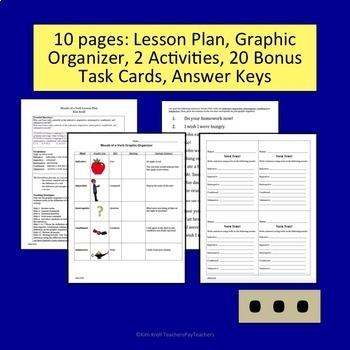 Students connect to the visuals and can use this graphic organizer. with future assignments. This PowerPoint is accompanied by an EATS lesson plan. Added Bonus: 44 Task Cards! This product is currently my #1 BEST SELLER. Thank you! CCSS.ELA-Literacy.L.8.1c Form and use verbs in the indicative, imperative, interrogative, conditional, and subjunctive mood. -- How can I use verbs correctly in the indicative, imperative, interrogative, conditional, and subjunctive moods? -- How can I form verbs correctly in the indicative, imperative, interrogative, conditional, and subjunctive moods? Check out the positive feedback on this product! The High School Bundle- Language Arts Lessons, PPTs & More!